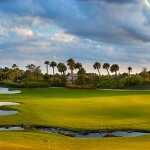 From the very inception of Old Palm Golf Club, the community has been deeply committed to protecting the environment. As a result, Old Palm received the Audubon International Signature Programâs revered gold certification, the highest level possible, which Old Palm still maintains through continued environmental conservation. Here are just a few of the ways that Old Palm protects the communityâs bio-diversity, conserves water and sustains resources: Only native vegetation used. During the initial development, exotic species were removed and literally millions of native plants were installed. The list of plants includes everything from mature live oaks to small aquatic vegetation that formed breeding and nesting areas for aquatic birds and fish. Native wildlife protected. Preserving the native vegetation has allowed the existing wildlife to thrive and has attracted other native species. Old Palm has even set aside acreage for native gopher tortoises to live undisturbed in the northern portion of the property. Lake system naturally cleanses water. As the storm water in Old Palm flows into the interconnected lake system, it passes through collection areas called phytozones. Theyâre designed with berms to slow the water flow and allow silt to settle out. The numerous aquatic plants on the berms act as a natural filtration system. Lakes lined to protect the ground water and reduce water loss. Old Palmâs lakes are lined to prevent the lakesâ reclaimed water from leaking into the ground water. Lining the lakes also minimizes water loss, so thereâs more reclaimed water for irrigation. Reclaimed water used extensively. The overwhelming majority â a full 98% â of the water used to irrigate Old Palm is reclaimed, not potable. Native vegetation requires less water. Old Palmâs liberal use of native plants includes the Sea Dwarf Paspalum grass that carpets all of the golf course, the common areas and home sites. It grows well with reclaimed water and requires 20% less water than Bermuda grass.